SkyCalc 3.0® runs on Microsoft Excel™ 7.0 or a later release running on a compatible Windows platform of Windows 95™ or later. Installation requires a minimum of 25 MB of free disk space. SkyCalc 3.0® comes as a self-extracting zipped file. After you have downloaded the file to your hard drive, unzip it to a convenient location using a program like WinZip or right-click and uncompress using the uncompress utility in Microsoft Windows. Double-click on the SkyCalc30.xlt file to start the program. Make sure to read the Instructions tab for direction on enabling Macros and saving the file in your templates folder. The SkyCalc30 download comes with 16 California Climate Zone weather files. Additionally, weather files for 33 US cities can also be downloaded from this webpage. To use SkyCalc3.0® for any other location, a weather file needs to be generated. This can be done using the SkyCalc Weather File Generator utility in eQuest 3.61b (or higher). eQuest is available as a free downloaded from the DOE2 website. A SkyCalc3.0® weather file (.wea3) can now be generated for any location in the world, as long as a DOE2 compatible weather file (.bin) is available for that location. 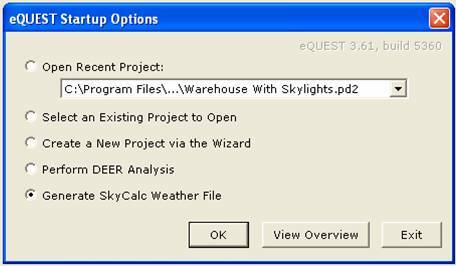 Step2: On the Startup Options Screen, select "Generate SkyCalc Weather File"
Step3: In the SkyCalc Weather file Generator Window, select the Coverage, Region and City for the location of which you want the SkyCalc weather file. Step4: The options for Energy Code and Climate Zone are selected on their own. Review these options and modify them if needed. Step5 (Optional): Match the Roof Type and Roof U-factor closest to your project in SkyCalc for which you intent to use this weather file. This step is optional and need only be changed from default if the intended project is known. Matching the roof type to your project increases SkyCalc's accuracy in thermal calculations. 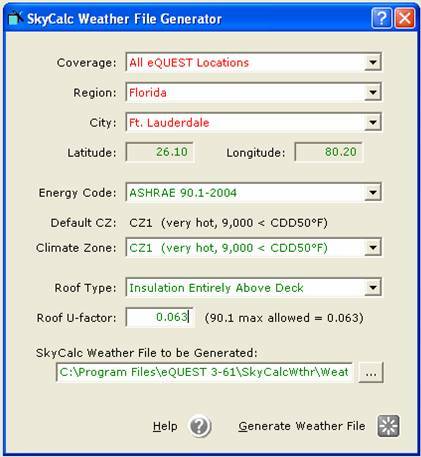 Roof U-factor may be modified within SkyCalc after a weather file has been created under Optional Inputs Tab (Row 29). Step6: Click the Generate Weather File button to create the SkyCalc 3.0® weather file for your location which gets saved in the location indicated under SkyCalc Weather File to be Generated.